To all SONY fanatics out there, this promo is for you. SONY Philippines announced their biggest sale ever this 2013. The SONY BIG Thanks BIG Deals. From May 31 until June 2, 2013 at the Main Activity Center of Trinoma Mall in Quezon City. You can get up to 70 % percent discount from all SONY products. BRAVIA, cybershot, handycam, IC Recorder, Playstation, VAIO Laptops, walkman and XPERIA. So check the date on your calendar and save your money for this BIG Sale of SONY. For the meantime, If you feel that this details are informative, please bookmark it now or visit this site more often for you to be updated. You may also share this post to your friends so they may know about SONY BIG Thanks BIG Deals promo. 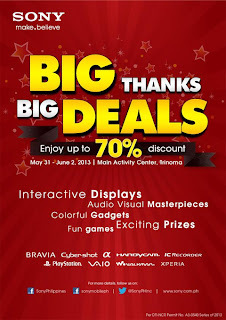 Comments or suggestions about "SONY 70% off Big SALE on May 31 to June 2" is important to us, you may share it by using the comment box below.